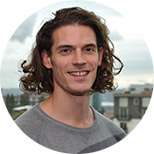 Luc E. Coffeng was a Post-Graduate Fellow in the 2013 cohort at IHME. As part of Global Burden of Disease (GBD) team, Dr. Coffeng worked on estimating the global burden of skin diseases, non-melanoma skin cancer, and neglected tropical diseases (NTDs), and contributed to the capstone papers on the GBD 2013 study. Further, he co-authored several papers on the burden of skin disease and NTDs from the GBD 2010 study, which he had previously participated in as an external expert. After his time at IHME, Dr. Coffeng went on to work as a Post-Doctoral Researcher at Erasmus MC University Medical Center in Rotterdam. Coffeng LE, Pion SDS, O’Hanlon S, Cousens S, Abiose AO, Fischer PU, et al. Onchocerciasis: the pre-control association between prevalence of palpable nodules and skin microfilariae. PLoS Neglected Tropical Diseases. 2013;7(4):e2168. Coffeng LE, Stolk WA, Zouré HGM, Veerman JL, Agblewonu KB, Murdoch ME, et al. African Programme for Onchocerciasis Control 1995-2015: model-estimated health impact and cost. PLoS Neglected Tropical Diseases. 2013;7(1):e2032. Coffeng LE, Fobi G, Ozoh G, Bisseck A, Nlatte B, Enyong P, et al. Concurrence of dermatological and ophthalmological morbidity in onchocerciasis. Transactions of the Royal Society of Tropical Medicine & Hygiene. 2012;160:243–251. Monsters lurking in the closet, getting lost in the grocery store, misplacing a favorite toy – these are some of the things I worried about growing up. But I was lucky in many respects. If I got pneumonia or was afflicted by a diarrheal disease, there was a very good chance it’d be treated quickly and with the right drugs.